describe some of the major abnormalities of the nervous system. Only the initial stages in development of the nervous system will be considered at this time. These include formation of the neural tube and its differentiation into three layers, the formation of the three primary brain vesicles and spinal cord, and the origin of the peripheral nerves. Most of the neural tube is formed by folding and closure of the neural plate, a region of thickened ectoderm. This process is called neurulation. Neural crest cells migrate away from the site of closure, and play an important part in the development of the peripheral nervous system, head and neck structures, and the pigment cells of the skin. 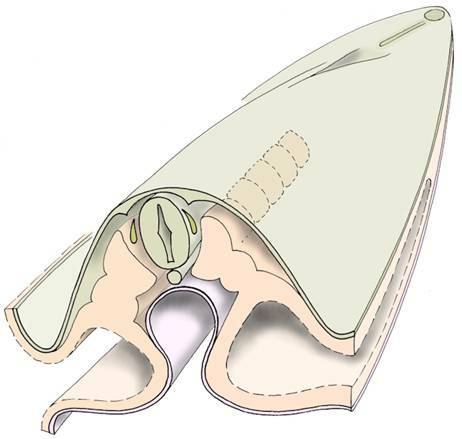 Interestingly, the most caudal tip of the future spinal cord develops by a different process: the neural plate closes at its caudal end (caudal neuropore), and a solid cord of cells is built onto the end of the existing neural tube. A central lumen then develops within this cord secondarily. 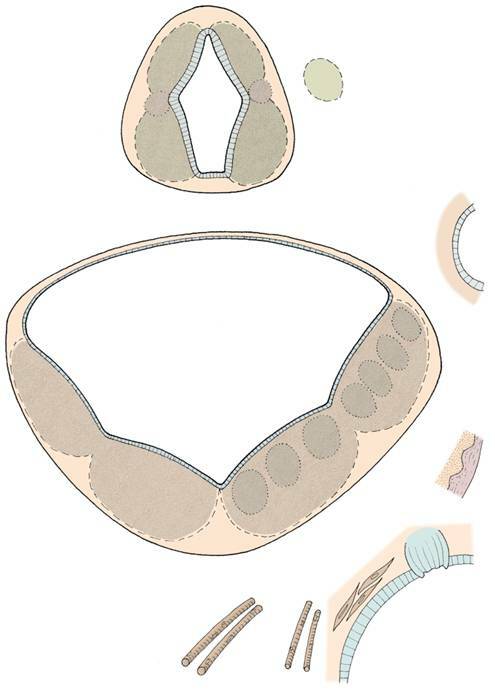 There is a complex transitional region where the neural plate method of development gives way to the second method of neural tube development, and sometimes errors occur in this process (spina bifida). 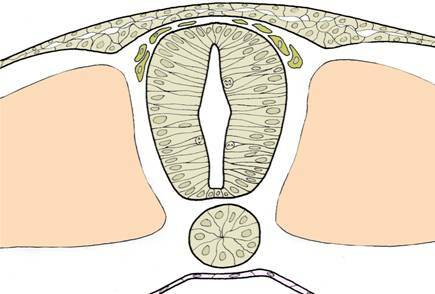 The following illustrations show formation of the neural tube and brain. Ectodermal cells are migrating through the primitive streak (upper right) to enter the space between the ectoderm and endoderm and form the mesodermal layer. Mesodermal cells form the compact, rod-like notochord which extends forwards beneath a thickened region of the ectoderm called the neural plate. 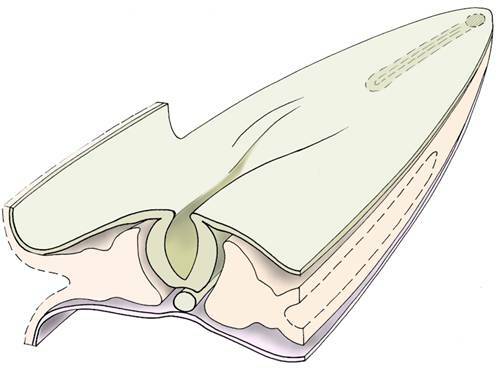 The neural plate begins to fold, forming the neural groove, and the edges of the groove rise up towards each other. The notochord can be seen ventrally. The neural folds approach each other and fuse first in the middle region of the neural plate, and then closure extends forwards and backwards from this point. In this way most of the neural tube is formed. The primitive streak is still a site of active invagination of ectodermal cells. Along the line of fusion of the neural folds, some of the cells break free and become migratory within the mesodermal layer. These are the neural crest cells, and are shown here as tan-coloured clusters of cells resembling 'teardrops' alongside the neural tube. Mesodermal cells on each side of the neural tube begin to form a row of regular, compact structures called somites. 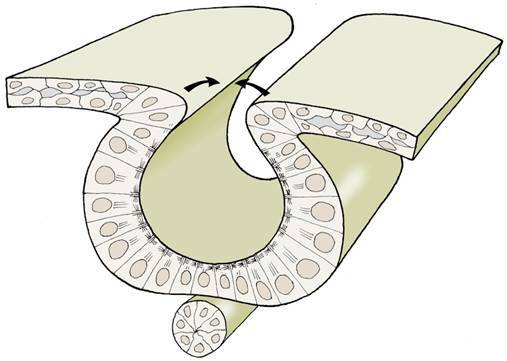 These three diagrammatic cross-sections summarise the process of folding and closure of the neural plate to form the neural tube, and the subsequent migration of the neural crest cells. 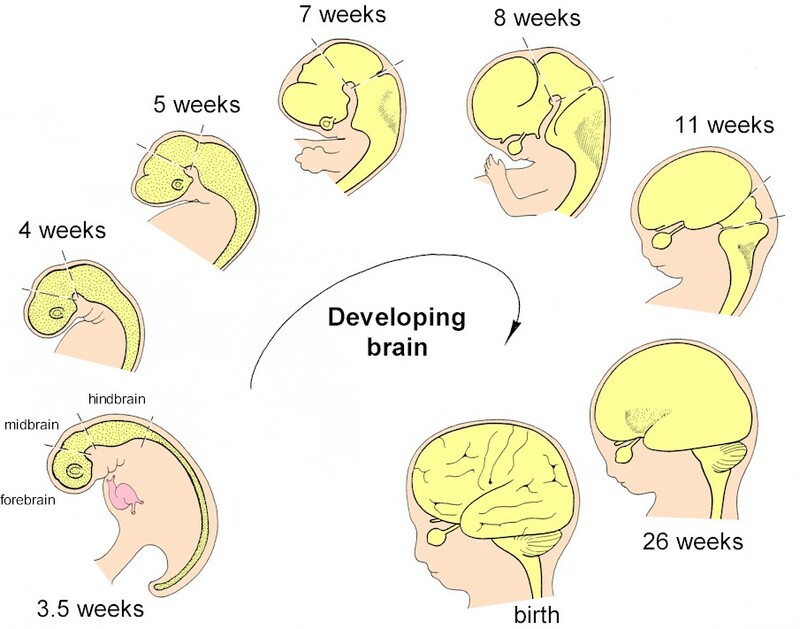 This diagram shows development of the brain from the middle of the fourth week after conception up until birth. The three brain vesicles (enlargements) at the future head end of the neural tube are named forebrain, midbrain, and hindbrain. The forebrain vesicle goes on to form the cerebral hemispheres, the diencephalon between them, and the retina of the eyes. The midbrain does not grow as rapidly as other parts of the brain, and becomes obscured by other enlarging structures such as the cerebral hemispheres and cerebellum during the fetal period. The hindbrain vesicle forms the cerebellum, pons, and medulla oblongata. The remainder of the neural tube forms the spinal cord. The neural plate has an epithelial organisation. Most of the cells are wedge-shaped and elongated (microtubules and microfilaments produce these changes in shape) and extend from the basal surface of the epithelium to the apical surface. The exceptions are cells that are dividing - these round up to the apical surface to divide, and the daughter cells then elongate until they contact the basal surface. 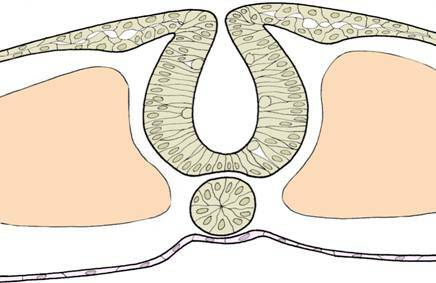 After closure of the neural plate, the neural tube retains its epithelial organisation. The sidewalls are much thicker than the roof and floor plates. 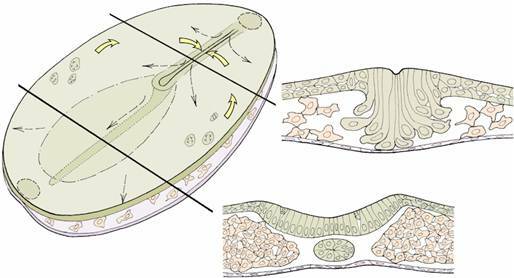 Cell division continues, and then a change in organisation becomes apparent: newly-formed cells are released from the neuroepithelium and begin to form a new layer around the periphery of the neural tube. The cells in this new layer - the mantle layer - are neuroblasts, which means that they will later differentiate into neurons (nerve cells). The mantle layer is not of equal thickness throughout, but is arranged in four longitudinal columns - two dorsal, and two ventral. The dorsal columns are called the alar plates and the ventral columns the basal plates. As the neurons within these columns differentiate, they form the grey matter of the central nervous system. The processes (axons) which grow out from the neuroblasts in the basal plates pass out into the body as the motor components of the peripheral nerves, or pass to higher or lower levels to link with other neurons. The neuroblasts of the alar plates receive incoming fibres from the dorsal root ganglia, and will send their axons to other regions of the central nervous system. As more and more fibres develop, a third layer is built up around the periphery of the neural tube - this is the marginal layer. later, when the fibres become myelinated, the marginal layer will form the white matter of the neural tube. The spinal cord retains this simple arrangement of inner grey matter and outer white matter, but in the brain the organisation becomes more complex. Neural crest cells have diverse fates within the embryo, and contribute to many important structures. The central nervous system is developed from a hollow, tubular structure - the neural tube. The central lumen persists throughout development: in the spinal cord it becomes the tiny central canal, but in the brain region it becomes modified into broad and narrow portions - the ventricular system of the brain. There are two lateral ventricles, a third ventricle, and a fourth ventricle. These communicate with each other and with the central spinal canal. Describe the process of cell division in the neural plate and neural tube. Which organelles are thought to take part in folding of the neural plate? List the types of cells that can develop from neural crest cells. Name the three layers that can be recognised in the neural tube as it differentiates. What is the embryological origin of postganglionic parasympathetic neurons? Name the three primary brain vesicles. Which part of the brain are derived from each of these? Name two congenital abnormalities of the central nervous system that are thought to be the result of non-closure of the neural plate. What is hydrocephalus? What might be the consequences of this condition for brain function? When does circulation of cerebrospinal fluid begin?